I would like to see some more documentation as to pinouts and IO instructions. Being new to Arduino and this board being a cut down version it would be nice to have some rudimentary discussion of how to hook thinks up. I did have success in a small program to use the button to toggle between a blinking yellow and green led's on ports 1 and 2 switch on 3. I used a pull down resistor on the switch after seeing the usual floating behavior and resultant weird behaviors but a little of my old digital logic background and that got straightened out. I next want to start working with the motor controls. I have a radio shack micro motors and a vibration motor and a server to play with. Is there any good wiring examples of using the motor boards for these devices? Seconded. I recently received my TinyLily boards and several motor boards. I have a few cool ideas for projects that I'd like to try building, but I'm a little hesitant to start wiring up the motor boards. They are so tiny and there are no instructions. Please, try to set up some basic instructions for all your current boards! 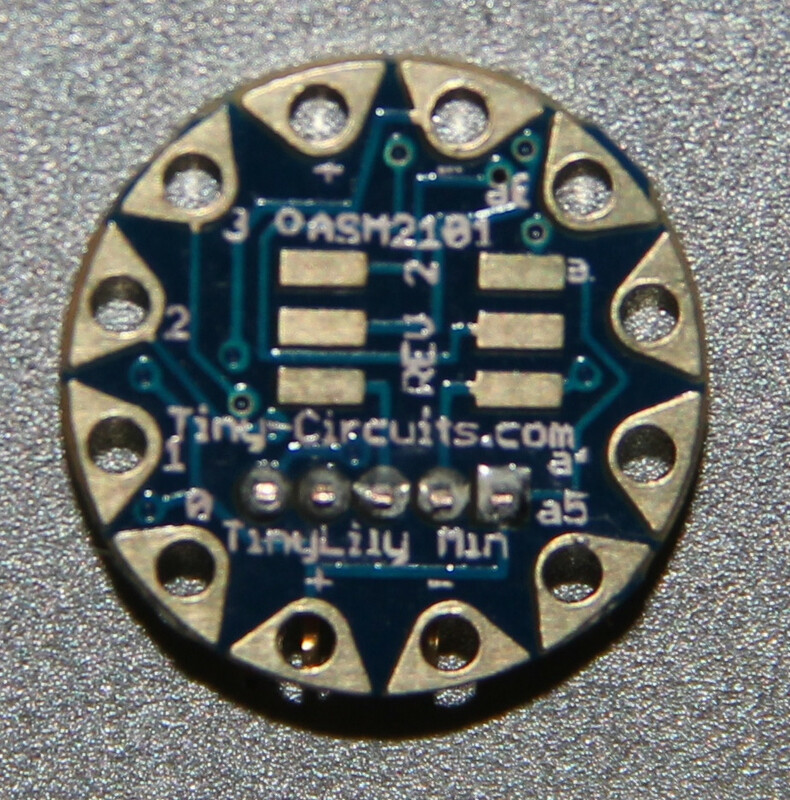 And I'm really looking forward to a tiny accelerometer board for TinyLily! Sorry for taking so long to get better documentation up. We're getting a number of new things up over the next week or two, one of the first ones is for the TinyLily Motor board documentation and some examples of how to use it. Here's our first draft of this, we plan to update this with some photos and a video early next week. The emails after the kickstarter kept soliciting the submission of projects that had used the hardware. That doesn't make much sense when there's not even a pinout available to base a project on. I spent some time this afternoon trying to get the TinyLily to work, with mixed results. Here's the pinout as best I've found so far. The challenge was increased by the silkscreen being incomplete. I figured out that pin 3 is pwm only because it's used that way in the motor shield demo on this site. I'm guessing the board is not working correctly, it seems like 0 and 1 should be digital I/O as well. You can see the "official" Pinout in the TinyLily's sales page. Just go under photos and scroll through to see the 3D renderings, which are clearly marked. I don't have the link handy so you'll have to go find it yourself. 0 and 1 are marked as dual-purpose in the schematic (can be D0/D1 or tx/rx), so maybe you have Serial I/O enabled on them in the loaded sketch? The sketch is super basic, was just using something similar to the usual blink code to test the digital outputs. Unless the serial port has to be expressly disabled, that's not it. I finally found that PDF on the fourth tab of the TinyLily shop page in the bottom of a locked filing cabinet stuck in a disused lavatory with a sign on the door saying 'Beware of the Leopard'. Perhaps a link to it from the "Learn" page would be prudent as well. Hey that PDF is helpful! Although I have no idea what to use that information for, haha. I believe they are the other way of accessing the processing chip directly, without the USB board. I tried some simple variants of the blink sketch to try and understand the board schematics (this is my first Arduinoish device). I agree that tab zero does nothing - it seems to be continuously powered. The tab marked 1, 2, and 3 are referred to by the same numbers, so to make an LED blink when connected to tab 1, replace the "int led = 13;" with "int led = 1;". I hope this is helpful for others. Now I need to learn how to do the same thing with the analogue pins.